As you know, I’ve been trying making some changes to my eating habits recently. The Whole 30 program and the Instant Pot have played a big role in my kitchen lately.Amazon affiliate links included The Essential Instant Pot Cookbook (Ten Speed Press) is written by Coco Morante, of the blog Lefty Spoon, but more importantly — she runs the official Instant Pot Recipes page on Facebook. 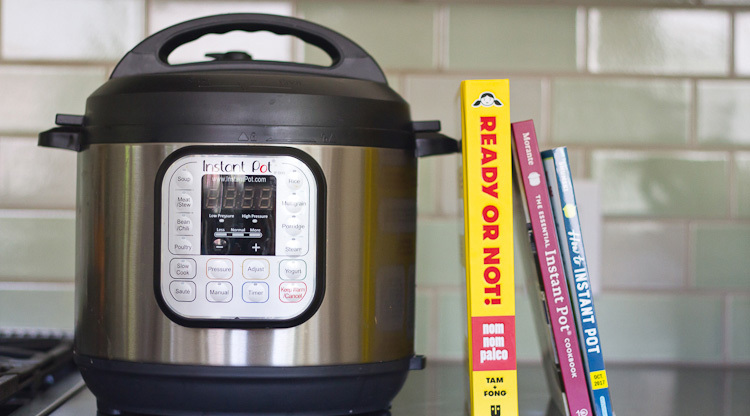 For what it’s worth, this book bears the “Authorized by Instant Pot” stamp on its cover. Not surprisingly, this cookbook has the most detailed directions on using the machine, including general guidelines on converting your own recipes for the Instant Pot, a detailed troubleshooting guide, and a cooking charts for many common meats, vegetables, and grains. But how does the food come out? There are over 75 recipes, a nice mix of different styles and ethnicities including: Momo Meatballs, Korean Braised Beef Short Ribs, Indian-Inspired Okra and Cauliflower, Rosa Vieja, Jamaican-Jerk Spiced Oxtails, and Pulled Pork Adobo. I tested out the short rib (galbijjim) recipe, and it was simple and delicious. Ready or Not! 150+ Make-Ahead, Make-over, and Make-Now Recipes (Andrews McMeel) is the second cookbook by Nom Nom Paleo power couple Michelle Tam and Henry Fong. Okay, technically, this is not a book dedicated Instant Pot cooking, but seeing as how Tam frequently posts pressure cooker recipes on her blog, I’m not surprised that there are seven recipes expressly for the pressure cooker, and many more that can be adapted. There is even a two-page pictorial spread on “10 Things You should Know About Pressure Cooking”. I love the ethnic variety in flavors, including lots of Chinese and Vietnamese-based dishes, such as XO Pork with Green Beans, Chinese Chicken (in a pot, slow cooker, or pressure cooker), Bò Lá Lôt and No Lá Lôt meatballs. Not only are all the recipes paleo and gluten-free, they are also indexed according to different dietary needs, including Whole 30. How to Instant Pot: Mastering All the Functions of the One Pot That Will Change the Way You Cook (coming in October 2017, Workman) by Daniel Shumski includes recipes for both the pressure cooker and slow cooker functions of the Instant Pot. Interestingly, there are quite a few Korean flavors, such as Kimchee chicken, Soft Tofu Stew, and Short Ribs with Garlic and Ginger. There are quite a few bean and grain recipes, including six kinds of chil, as well as a chapter devoted to cooking rice (I’m looking forward to trying some of the suggestions, as I haven’t had the best results making rice in my Instant Pot), as well as chapters on making yogurt, and using the steam setting. This would be a useful Instant Pot cookbook for people looking to use those features. Also, read my article about the Instant Pot sensation on NPR. It includes Michelle Tam, CEO Robert Wang, marketing guru Jim Lin, and Hip Pressure Cook founder Laura Pazzaglia.